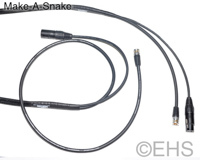 Make-A-Snake, Custom Braided Sleeving snake 1 1/4"
As a custom cable maker, we have seen the need for "Snake" cable configurations that are not commercially available. For example what if you need power and coax, guitar and mic, six guitar cables, or any other combination tied together for ease of setup and teardown? Now you can create it here on our site! We make a snake with the cables you select on the site with braided sleeving. The cables are bundled together and bound with braided sleeving and the ends the wires are secured with heat shrink tubing which is applied to make the transition from braid to fanout. This creates a "snake" out of almost any cable combination you can desire. With many options comes great possibility for error. This can be a bit complicated, but we are here to work with you to make sure you get the cable you intend. Also, this is a new product, so we are still working the bugs out of how to best sell this. This is an "ADD ON PRODUCT", you must select the cables you wish to have in your snake from the cables on the site and add them to the cart, then you add this product to the cart with the required options and info filled in below. One of these makes one snake and if you have cables to make three snakes then add three of these. Once we receive your order we may need to contact you for additional information or clarification. NOTE: If you are using multiple identical cables in this snake make sure you apply a text or color label to those cables so you will know which one is which. This is for braid size 1.25", and should fit from 5-15 wires depending on size. Because of the great range of cable sizes, if what you order does not fit we'll contact you to correct it (additional costs may apply). Length: This is the length of the braid for the middle of the cable (cable length - Fanout length A - Fanout length B = Braid length) Round up to the next length.